It took her 40 years to come back to her home country and the wait was “worth it”. South Carolina Governor Nikki Haley described her visit to Amritsar as a “personal” one rather than political. Union minister Harsimrat Kaur Badal today adopted Mann village in the Lambi Assembly segment to develop it as a model village as part of the ‘Saansad Adarsh Gram Yojana’. The Shiromani Akali Dal today appointed district observers in a move to complete the party’s organisational structure and fix responsibilities ahead of the municipal elections. Punjab Pradesh Congress Committee (PPCC) chief Partap Singh Bajwa today directed the Panchayati Raj Rural Development Cell of the party to check the penetration of the Rashtriya Swayamsevak Sangh (RSS) in rural areas. He also asked the BJP why it had not objected to the 'wrongdoings' of Akalis all these years. Elections to the municipal councils will be conducted in January for which arrangements are being made across the state, said Chief Minister Parkash Singh Badal. A lot of bad blood has been created between the alliance partners, the SAD and the BJP, in the state. As a result, the image of the state government has taken a hit. The political battle between the two has moved to the centre stage while the state’s development agenda has gone for a toss. Firing a fresh salvo against Chief Parliamentary Secretary (CPS) Dr Navjot Kaur Sidhu, Akali Dal CPS Virsa Singh Valtoha today asked her to tell the people “why she backstabbed her party and political mentor Arun Jaitley in the Lok Sabha poll. The SGPC has disbursed financial aid worth Rs 2 crore for the rehabilitation of Sikh families in the flood-affected areas of Jammu and Kashmir. Rajya Sabha Member of Parliament (MP) HK Dua has emphasised the need to promote science and technology among students to make India a superpower. Union Health Minister JP Nadda would soon lay the foundation stone for two cancer hospitals at Fazilka and Hoshiarpur to give fillip to the ongoing war against cancer launched by the Punjab Government. The ABVP today sought stringent action against politicians and officials involved in drug trafficking in the state. They also passed various resolutions on the second day of its national convention here. The ABVP also demanded student elections be held at the higher education institutes in the state. The ABVP members also took out a march through the city. An Indian-American Sikh has settled a five-year-old federal lawsuit that alleged she was fired from her job here for insisting on wearing a 'kirpan' to work. Former Houston Internal Revenue System (IRS) agent Kanwaljeet Tagore, 41, currently works as a self employed tax consultant in Houston. The Punjab and Haryana High Court has made it clear that consumption of liquor is against Sikh “maryada” and lenient view cannot be taken of a Shiromani Gurdwara Parbandhak Committee employee even if he indulges in drinking after the duty hours. Shiromani Akali Dal (SAD) general council member Jagtar Bhaini has been booked in two criminal cases. He allegedly embezzled funds under Mahatma Gandhi National Rural Employment Guarantee Act (MGNREGA). He earlier courted controversy for “selling” SGPC land adjoining Takht Keshgarh Sahib. Accompanied by her husband Michael Haley and her staff, Haley started her day early by paying obeisance at Golden Temple. Holding back her tears, Nikki described the visit as “special”. “I feel so honoured just to be here today. I came here as a humble person to pray and pay my respect and not in the capacity of the governor of a state. The serenity of the place is so amazing and I feel spiritually and emotionally overwhelmed.” Dressed traditionally, Haley stayed at the holy shrine for over an hour before moving on to visit Jallianwala Bagh, where she paid homage at the martyrs well. She was also accompanied by KJS Cheema, Special Principal Secretary to Chief Minister Parkash Singh Badal. The SGPC felicitated her by presenting a replica of the holy shrine and a ‘siropa’ (robe of honour). Nikki also met some of her relatives living in the city. “I had heard so much about the city from my parents, so many stories and memories. I feel excited to have come back and be able to relive some of those memories,” said Haley. One of her cousins, Kanwaljit Singh Randhawa, who lives in Verka, gifted her a phulkari shawl. Nikki also met Chief Minister Parkash Singh Badal in Chandigarh and announced collaboration with the state government in education, skill development, livestock and food processing industries. Haley, however, could not visit her ancestral village in Tarn Taran. Even as she appealed for harmony in the village, which has seen several clashes between supporters of political parties, the police today conducted raids in the area to build “pressure” on Congress activists. The police arrested Iqbal Singh. The village had witnessed major violence during the panchayat samiti and zila parishad elections in May 2013. The Lambi police had booked about 150 persons for attempt to murder and rioting. The development has spread panic among the Congress activists, who claim that the police had agreed to shut the case. Significant among the appointments is that of a Hindu leader, Parkash Chand Garg, who has been made observer of Bathinda district. The Akalis had trailed from the Bathinda Urban seat in the last Lok Sabha elections. 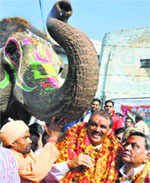 It hopes a Hindu leader may prove a better bet in the district. In other districts, Sikh leaders of the party have been given important positions. Dr Daljit Singh Cheema, SAD secretary, said Sukhbir had issued orders for the appointments. He said Bibi Jagir Kaur had been appointed observer of Gurdaspur, Surjit Rakhra Amritsar (urban), Sohan Singh Thandal Amritsar (rural), Sucha Singh Langah Pathankot, Sewa Singh Sekhwan Pathankot, Bikram Majithia Jalandhar, Sarwan Singh Phillaur Kapurthala, Ajit Singh Kohar SBS Nagar, Hira Singh Gabaria Hoshiarpur, Dr Daljit Singh Cheema Ludhiana (urban), Tota Singh Ludhiana (rural), Janmeja Singh Sekhon, Patiala, Parminder Singh Dhindsa, Sangrur, Sikander Singh Maluka, Barnala, Harmeet Singh Sandhu Faridkot, Prem Singh Chandumajra Mansa, Sharanjit Singh Dhillon Moga, Maheshinder Singh Grewal Mohali, Mantar Singh Brar Fazilka, Gulzar Singh Ranike Muktsar, Parkash Chand Garg Bathinda, Virsa Singh Valtoha Ferozepur, Santa Singh Umedpuri Fatehgarh Sahib and Iqbal Singh Jhunda Ropar. The PPCC chief cautioned party workers against the RSS spreading wings in the state at a meeting of the party cell held in the Congress Bhavan. He said this could lead to communal tension. Bajwa slammed the Akali Dal-BJP government for being anti-farmer, whose real face had been exposed during paddy procurement season. He said the BJP had an urban base that had no concern for the rural areas. He pointed out that the prices of wheat and paddy had increased by about Rs 700 per quintal from during the UPA rule from 2004 to 2013, while the increase under BJP-led NDA was just Rs 60 from 1999 to 2004. He said while the diesel prices in the world market were decreasing sharply, the SAD-BJP Government was increasing VAT on diesel, a move that would be opposed by the Congress. He slammed the Union Government for levying Service Tax on NRI remittances and said that this would encourage Hawala transactions. He said the BJP government was planning to make drastic changes in MGNREGA rules that would make the scheme less beneficial. While interacting with the media at a mass marriage ceremony at Bhankharpur village in Dera Bassi today, Badal said the SAD-BJP alliance would fight the elections jointly and a decision on the distribution of seats would be taken soon. On strained relations between the alliance partners, he claimed both parties shared a strong bond and would maintain it in future as well. Navjot had alleged none of the demands related to her constituency had been addressed. Badal said the farm section was at its saturation point now and there was a need to opt allied occupations. For switching over to other profitable occupation, the farmers must go in for crop diversification in a big way, he said. On his China visit, the CM said: “Our motive to visit the country was to study techniques used by Chinese in fish farming and allied occupations. In Punjab, per hectare production of fish is 6 tonnes whereas it is 33 tonnes in China, which is a record in itself. We will promote fish farming and other allied occupations in Punjab in a big way,” he added. The 21 underprivileged couples who tied the knot at the mass marriage ceremony were elated at the presence of Chief Minister Parkash Singh Badal, but they were left disappointed. The CM did not announce any ‘shagun’ money for the newlyweds, who were not even called personally to seek his blessings. Alarmed over the hostile posture adopted by BJP leaders towards it, the SAD leadership has alerted its frontline leaders to get back to its “panthic” agenda by making it a focal point of the political campaign in the countryside. The “panthic” agenda has remained political bread and butter of the SAD for decades. But in the recent past, the SAD had moved away from it, drastically changing the political character and charter of the party. What has made the SAD leadership uneasy is the fact that there is no apparent intervention by the BJP high command to stop its state leaders from attacking Akalis. Immediately after discussing its cracking relations with the BJP, the SAD leaders last evening announced the names of youth Akali leaders to fill top slots in the party’s youth wing. To make the dormant youth wing active again, two senior Akali leaders, including minister Sharanjit Singh Dhillon, have been made its coordinators. A structural change has also been made in the character of the youth wing. Until recently, there used to be one president of the youth wing, but five regional chiefs have been appointed to counter the influence of other parties, especially the Aam Aadmi Party (AAP), on the youth. It was because of the youth power the AAP won four Lok Sabha seats in Punjab in May this year. Moving further, SAD chief Sukhbir Singh Badal today appointed senior leaders of the party as observers of various districts units. Bibi Jagir Kaur has been appointed observer of Gurdaspur, Cabinet Minister Surjit Rakhra of Amritsar (Urban), Cabinet Minister Sohan Singh Thandal of Amritsar (Rural). Almost all senior leaders have been given this task. The purpose is to activate the party rank and file. Efforts are on to revive the Istri Akali Dal. Harcharan Singh Bains has been reappointed general secretary (publicity and media). He is also adviser on national affairs to Chief Minister. Bains, who is considered close to the CM, has a deep understanding of “panthic” politics. In the coming days, the SAD is likely to focus on issues such as removal of “injustice” done to Punjab on sharing of river waters, handing over of Chandigarh and Punjabi speaking areas to Punjab, greater share to state’s youth in Army recruitment, security of Sikhs settled abroad, turban issue and protection of the rights of minorities. In a statement released here today, Valtoha asked her to explain whether she and her husband made phone calls to Capt Amarinder Singh during the Lok Sabha election campaign. He also alleged that her relatives campaigned for Amarinder Singh in Amritsar and later for Preneet Kaur in the Patiala assembly bypoll. “You should also tell whether you are part of the BJP or part of a two person (husband and wife) team which uses the BJP’s tag only when it suits them. Since the party is of no importance to you, please explain whether you are a Congress agent who is playing according to a well laid out Congress game plan,” the Akali leader said. Reacting to Dr Sidhu’s statement to the media yesterday, Valtoha said she had now “invented a further excuse to up the ante against the SAD and was hallucinating about a promise of funds only she knew of”. He said Dr Sidhu's constituency received around Rs 75 crore from the Municipal Corporation and the Improvement Trust, besides being the largest recipient of MPLAD funds from her husband Navjot Singh Sidhu. The Akali leader said the issue of funds or lack of them was never an issue as far as her constituency was concerned. “The issue is of her personal ambition and that of her husband,” he said, adding the SAD had no role to play in this matter. Stating that “erratic and bizarre behaviour was intolerable” in coalition politics, Valtoha said Dr Sidhu could not enjoy being in the government and simultaneously oppose coalition candidates and even sit in Congress dharnas. “This shows you have little respect for your own state president who has rebuked you for speaking out of turn as well as party seniors who are responsible for taking decisions on coalition matters,” he said. 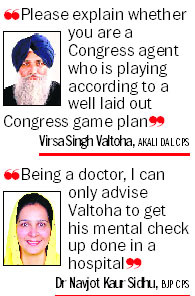 Dr Sidhu responded to his allegations by saying, “Being a doctor, I can only advise Valtoha to get his mental check up done in a hospital.” She also stated that had her constituency received funds worth Rs 75 crore the people in her area would not have been forced to live in virtually hell like conditions. She rejected all the allegations leveled by him as totally baseless. Diljeet Singh Bedi, SGPC additional secretary, in a statement, said they had kicked off the process to distribute aid to the affected Sikh families, which had been divided into three categories. “We are distributing cheques for Rs 50,000, Rs 30,000 and Rs 25,000 each to these families, depending upon the extent of damage caused to their houses,” he said. Bedi said the SGPC had been running a relief camp at a gurdwara in Budgam ever since the tragedy struck the state, besides dispatching a huge quantity of relief material to the Kashmir valley. In another development, the SGPC has sent 25 ‘birs’ of Guru Granth Sahib, 300 ‘gutkas’ of Gurbani, 10 harmoniums and five ‘tabla’ sets. SGPC chief Avtar Singh Makkar today urged Union Finance Minister Arun Jaitley to waive off entertainment tax on the movie ‘Char Sahibzade’, which is based on the life of Guru Gobind Singh’s sons so that every Indian could watch it. He has also written a letter to Chief Minister Parkash Singh Badal requesting him to make the film tax free. Dua was addressing students and teachers of government-aided schools after inaugurating a modern science laboratory at Lala Lajpat Rai Senior Secondary School here today. He said the hi-tech lab, built at a cost of Rs 30 lakh, would prove a blessing for the students in Bassi Pathana. The MP said the country had no dearth of talent and the Union and state governments should improve the infrastructure at government schools. He said the vacant posts of teachers should be filled on priority to provide quality education. Senior journalist and a former student of the school, Gobind Thukral, who had been instrumental in securing the Rs 30 lakh grant, said the institute was playing a major role by providing quality education to students in the area, especially those from the economically backward sections. The decision was taken by the Union Health Minister during a meeting with his Punjab counterpart Surjit Kumar Jyani here, a government spokesperson said. The Union Minister issued instructions to his staff to expedite the proceedings so that physical work on these projects could be commenced soon. He also asked Jyani to work out the plan for laying the foundations at the earliest. In their resolutions, students sought a check on Naxal activities; action against drug traffickers; support for Indian boxer Sarita Devi; and demanded student elections be held at institutes. Chahal said more universities should be set up in the public sector. He said the dozen private universities were exploiting the students, which is why elections should be held at the universities. ABVP leader from Delhi, Mohit Nagar, said some institutions appointed sham student councils to fool students. The ruling by the Division Bench of Justice Satish Kumar Mittal and Justice Deepak Sibal came on an appeal filed by Piara Singh against the SGPC. Employed as a sewadar with the respondent committee, he had challenged the order dated November 14, 2013, passed by a Single Judge, whereby his writ petition against the termination of his services by the SGPC in October 2009 was dismissed. The appellant, found in “drunken condition” on March 16, 2009, admitted the same day in writing that he had consumed liquor. Thereafter, he was sent to the Amritsar Civil Hospital for medical examination. The doctor reported that the appellant smelt of alcohol in his breath. He was initially placed under suspension and chargesheeted before the order of his dismissal from service was passed. Taking up his petition, the Single Judge refused to interfere with the termination orders, resulting in the filing of the appeal before the Division Bench. His counsel argued before the Bench that the appellant had not consumed liquor during the duty hours. After hearing the counsel, the Bench asserted: “We do not find any substance in this argument. The appellant has admitted that he consumed liquor and this fact was also proved by his medical examination. In similar facts in Mahavir Singh versus SGPC decided on August 13, this court has already held that as per the service rules of the SGPC and the guidelines issued from time to time, consumption of liquor is a disqualification for a person to seek employment with the SGPC”. The police said Babuji of Bhaini village complained that money was withdrawn from his account and his mother Jeeto Devi’s account. He alleged MGNREGA funds were first deposited in their accounts and later withdrawn by unidentified persons. The police found that Bhaini withdrew Rs 29,000 from the two accounts fraudulently. Anandpur Sahib DSP SS Dhaliwal said Bhaini verified the identity of the persons withdrawing money as Babuji and Jeeto.